Maverick Viñales (Team Suzuki Ecstar) has taken a historic first win for Suzuki since their return to the championship, as the 2013 Moto3™ world champion was in a class of his own at the Octo British Grand Prix to become the seventh winner so far in 2016. Viñales, who got his first podium in Le Mans in the French GP, got a front row start and simply pulled away once clear at the front – putting in an incredible performance to cross the line over 3 seconds clear. 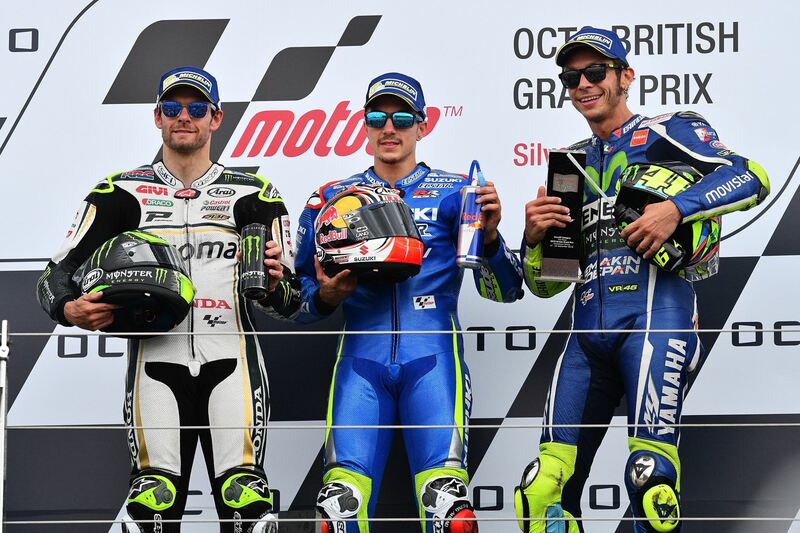 After an almighty battle behind, it was home hero and pole sitter Cal Crutchlow (LCR Honda) and Valentino Rossi (Movistar Yamaha MotoGP) who completed the podium. 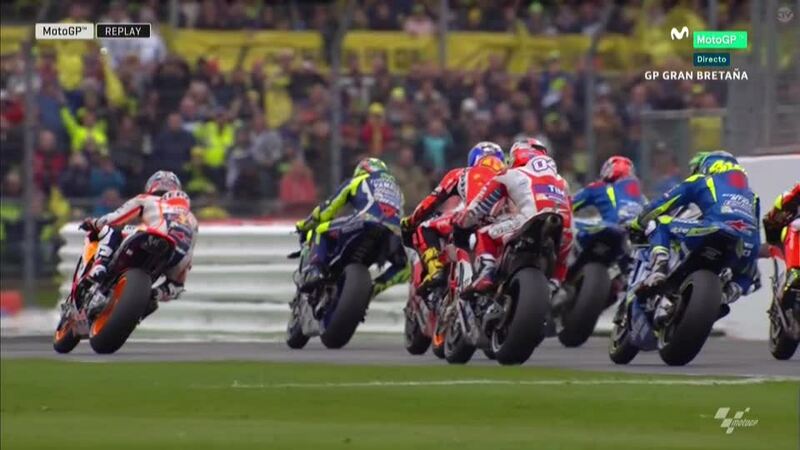 There was Lap 1 drama as the Octo British Grand Prix got underway, with rain threatening the grid and bike swaps practiced in morning Warm Up, but the weather remained dry for the length of the race. With the initial lights out it was Maverick Viñales at the front, before an incident between Loris Baz (Avintia Racing) and Pol Espargaro (Monster Yamaha tech 3) brought out the red flag and the two riders went to the medical center. 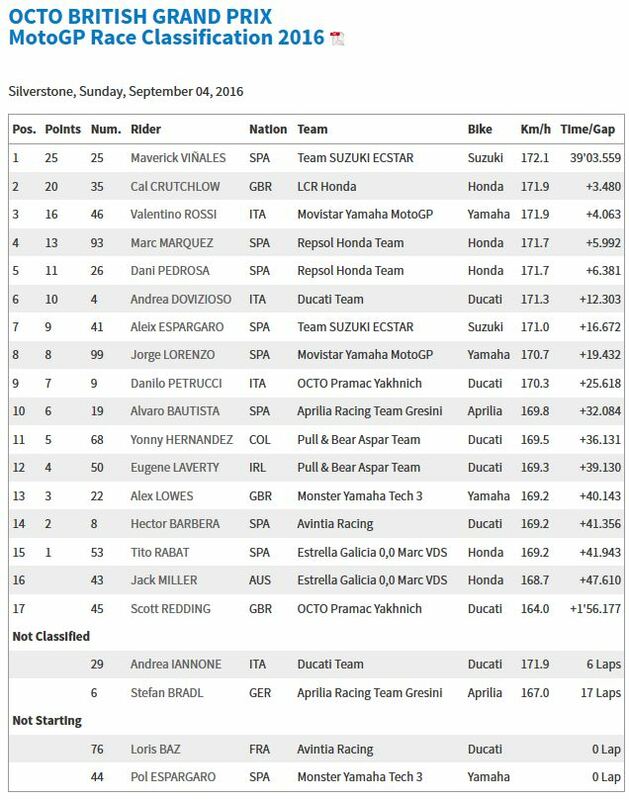 On the restart, the front row of the grid of Crutchlow, Rossi and Viñales fought for the lead, with Crutchlow taking the position early before Viñales got through to lead and pull away. With Viñales away at the front once again, Marc Marquez (Repsol Honda Team) led a five bike train of Rossi, Crutchlow, Andrea Iannone (Ducati Team) and Marquez’ teammate Dani Pedrosa in the chase, with reigning champion Jorge Lorenzo (Movistar Yamaha MotoGP) having a difficult race as he circulated in P8 despite his stunning record at the British venue. With Rossi then taking over in P2, Viñales was still over two seconds clear and the chase was on. Iannone, after making his way to the front of the chasing group, then lost his Ducati with 6 laps to go and suffered a DNF, leaving Crutchlow in P2 and Rossi and Marquez to duel it out. With the Italian and the Spaniard the two men at the top of the championship – although Marquez 53 points clear – it was a battle royale for points, pride and supremacy as the two fought it out. 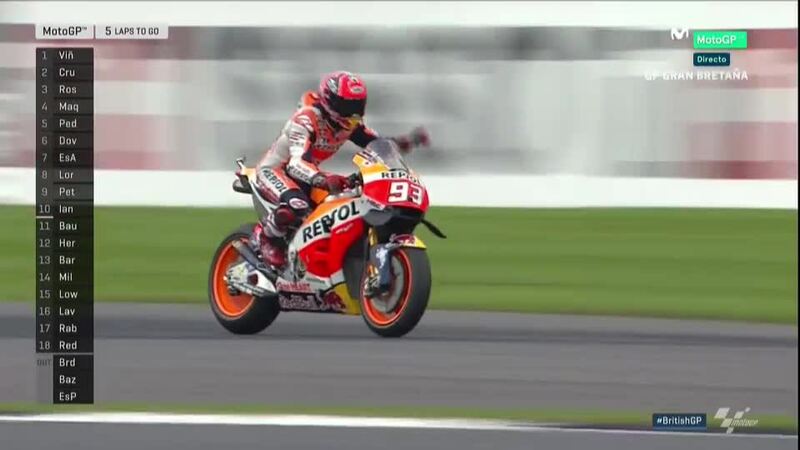 With characteristic hard racing and some incredible moves from each, Marquez eventually broke away from his Italian title rival to close on Crutchlow – before running deep and dropping back behind teammate Pedrosa into P5, into another battle that he just won to come home P4. Pedrosa had a calmer ride than his teammate to the top five, but looked to have made an incredible leap forward in the setup of his Repsol Honda as he got back to the front. Andrea Dovizioso (Ducati Team) came home P6 in a solid ride despite having twisted his knee in a testing crash ahead of the event, with Aleix Espargaro on the second Team Suzuki Ecstar similarly riding after a recent injury to come home P7. Jorge Lorenzo crossed the line eighth after struggling for grip, with Danilo Petrucci (Octo Pramac Yakhnich) and Alvaro Bautista (Aprilia Racing Team Gresini) completing the top ten. Home hero Scott Redding (Octo Pramac Yakhnich) was the last to cross the line after a crash, with compatriot and replacement rider Alex Lowes coming home in P13 on the Monster Yamaha Tech 3 in a solid first MotoGP™ performance. The grid now head for Misano World Circuit Marco Simoncelli for the next race, with Marquez still clear at the front despite Rossi taking a small amount of points back from the Spaniard’s lead. What was the strategy for the Silverstone Grand Prix? Again we had unstable weather during the weekend, so tire choice was very difficult, especially for Marc. He had no time to test the hard front tire during practice, so to be safe, he chose the soft front for the race. 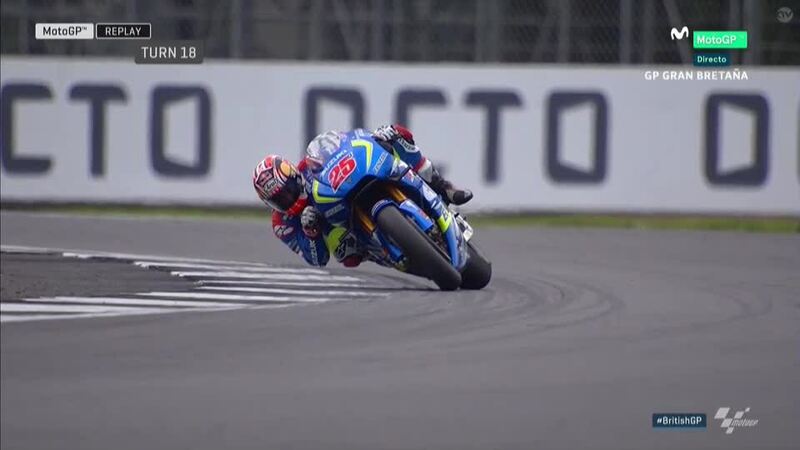 The strategy was not to push too much at the beginning to save the tires and he did a good job that allowed him to fight for the second position until the end. Dani had front and rear softs, so his strategy was also to manage the tires as much as possible. Positive and negative points after the race? The positive is that Marc has lost only three points in the Championship and that Dani was able to keep a strong pace all through the race. 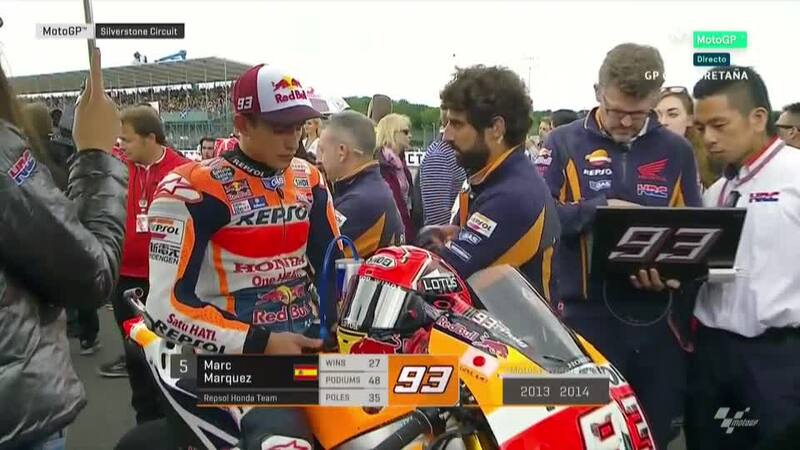 The negative is that Marc lost a podium place in the last laps. It is also positive to see Cal competitive again after his first MotoGP win at Brno two weeks ago! Also, very important is that Honda lead the Constructors’ World Championship after winning three of the last five races, which I think is a great achievement for everyone at Honda! I think all the fans that had the opportunity to watch the race on TV were very excited about the great battles for the podium, just as we were on the pit wall! 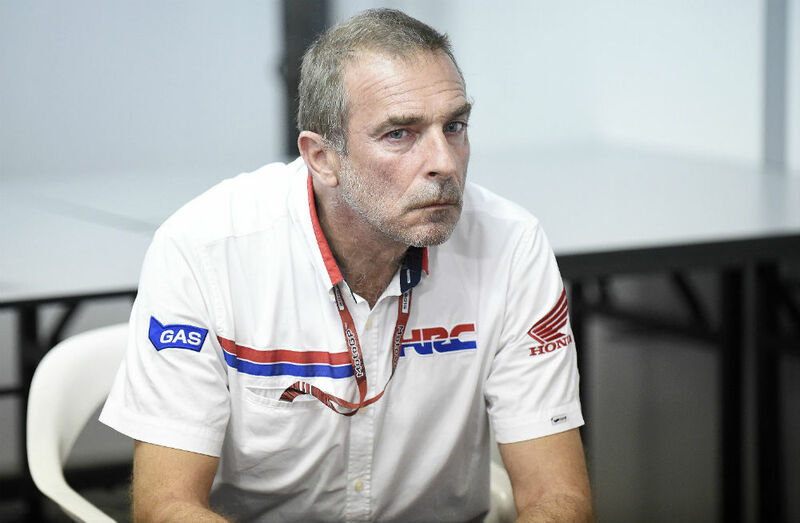 Our congratulation to Maverick, who did a great job today, but we were also very happy to see not only Marc but also Cal and Dani competitive, showing that the RCV is growing and that our HRC technicians are doing a good job. The inside story, apart from the official comments? It was a special weekend for HRC because Toni Bou won his 20th Trial World Championship and Tim Gajser won his first MXGP Title. We would like to congratulate the riders and their teams for these great results! After the 12 races we have had seven winners. Why do you think this has happened? For sure this season is something special! It is good for the fans to see so many different winners and I believe that it is mainly related to three things: the unstable weather, the fact that we have a new tire supplier and the competitiveness of several manufacturers. The weather has been difficult many times this season, and the flag-to-flag races always give more chances to riders who choose the best strategy. For the tires, Michelin is doing a great job, but clearly riders and teams have no experience of the tires from previous seasons. This means it is easier to make a mistake or indeed to make the correct tire choice, which can give riders an advantage or a disadvantage depending on the situation. The third reason I believe is that Ducati and Suzuki are now more competitive than in recent seasons. This is maybe related to the new single-software regulations. Anyway, overall, I think this is one of the most exciting MotoGP championships I’ve ever seen!